Shop Knowledge center Crop protection & disinfection How does pollination with bumblebees in greenhouses work? How does pollination with bumblebees in greenhouses work? Pollination is crucial for a good and healthy crop: without pollination, most crops will not develop or develop optimally. Most horticultural crops (especially tomato, sweet pepper, egg plant, zucchini, strawberry and melon) depend on insects (eg. bumblebees) tor the transfer of pollen, but greenhouse plants are out of reach of wild pollinators. Therefore pollination has to happen in a different way. In the past this was done with ‘tomato vibrators’, but in present day horticultural businesses more often use bumble bees to accomplish this. Pollination through bumblebees is much less labour intensive and therefore cheaper. Pollination is the transport of pollen where it is transferred from the stamens to the pistil of the flower. This can take place via insects, such as bumble bees. Lower cost is not the only advantage of the use of bumble bees. Bumble bees provide more effective pollination, which leads to higher crop quality and therefore higher revenue. Pollination creates better development of crops and therefore the growth of more, larger and better formed fruit. Pollination further leads to faster ripening fruit, which makes the harvesting period shorter and causes more harvests. Bumblebees belong to the Anthophila and are insects. Various species of bumblebees are used worldwide to pollinate flowers and plants. In Europe, Bombus terrestris, also known as earth bumblebee, is a common choice. The choice of a type of bumblebee depends on various criteria. An important criterion, for example, is that the species must be suitable for pollination of various crops such as tomatoes, cucumbers and aubergines. A standard population of bumble bees contains a bumble bee nest with an active queen and a growing folk. The queen directs the population with the aid of workers that fly out to collect pollenfor the larvae and workers that stay inside the nest to build and feed and care for the larvae. A standard bumble bee population consists of a easily handled cardboard box with a good ventilation system. The box has a compartment with a bumble bee nest and a container of sugar water, where the bees syphon water through a wick. Bumblebees can be used with the different crops in greenhouses as well as vegetable and fruit cultivation. Bumblebees can be used with the following crops in greenhouses.Click on the crops below for more information regarding bumble bees in vegetable or fruit crops. Our product specialists can advise you on the proper use of bumblebees with your crops. In addition, Royal Brinkman, as co-owner of the Spanish bumblebee production business, offers you Agrobio active and strong flying pollinators. Please contact one of our product specialists, or fill in the form below. On working days we will contact you within 24 hours. 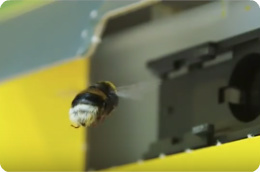 - How do you place bumblebee hives?